Did you ever make paper boats as a child? 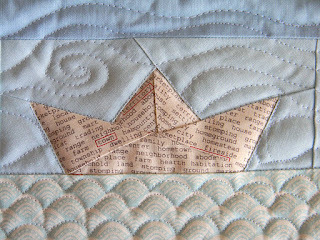 I drafted my own paper pieced pattern for this tiny boat and used a print from Hometown that reminded me of newsprint. 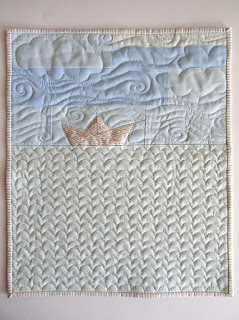 The water is a scallop from Spa, and I quilted it to resemble ocean swells. 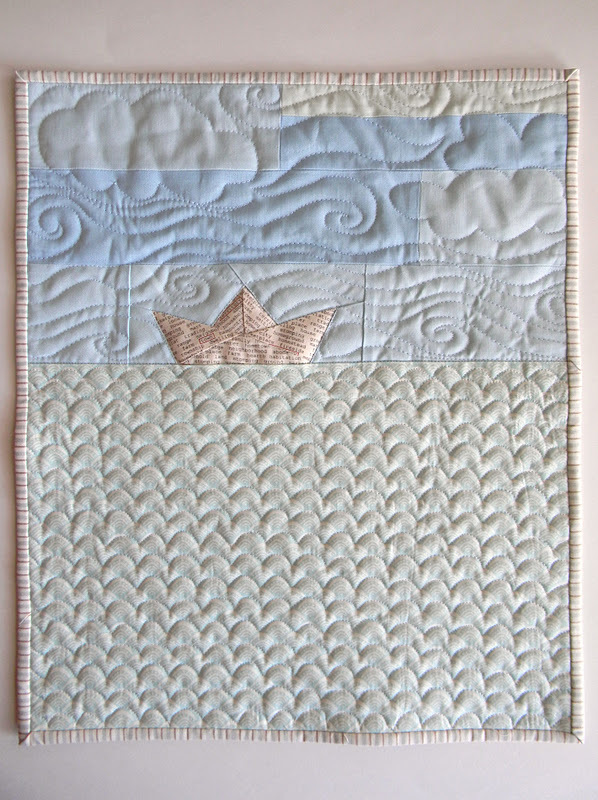 It's a windy day, and this whimsical boat is sailing away. I had a lot of fun with this mini (14 x 17). 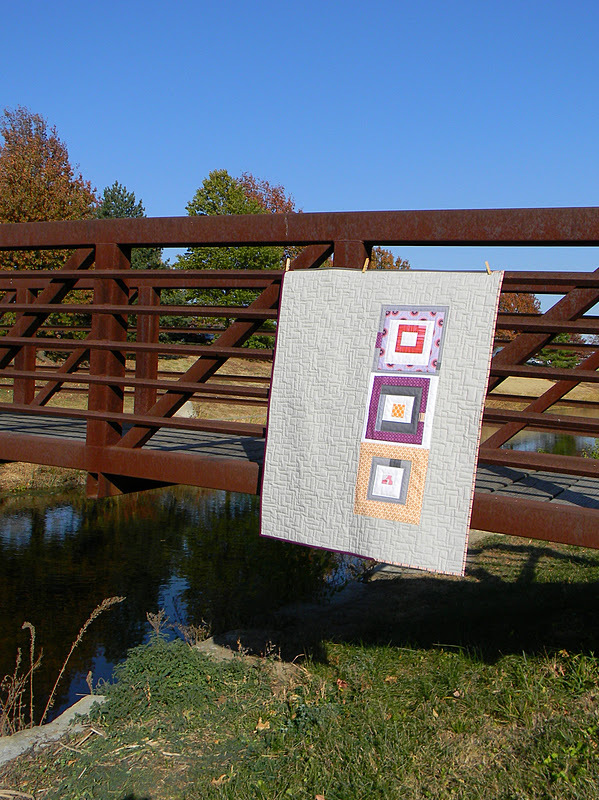 Next up, a baby quilt version in more saturated colors. I hope you all have a wonderful Thanksgiving Day (or weekend, if you're not in the US). I finished this fall tree pillow just in time for the end of autumn. 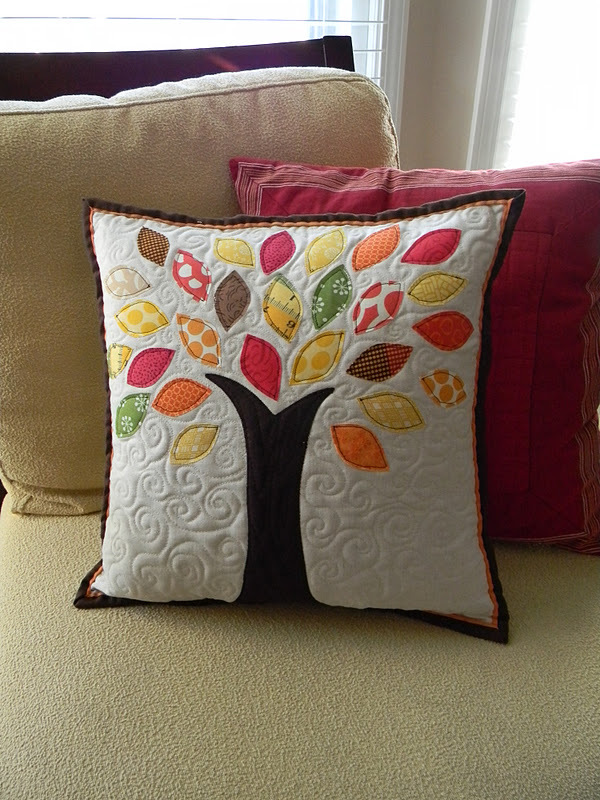 I added my leaves after I sandwiched the top with batting, so I was able to quilt it as I went. I think it adds some nice texture. 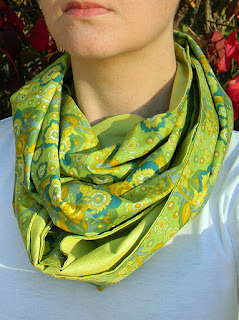 I've started some Christmas sewing, and scarves are a great, one-size-fits-all gift. 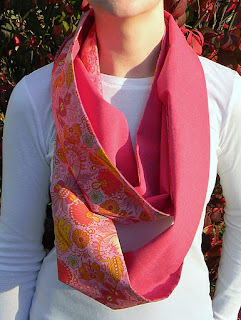 These infinity scarves are made from super soft voile and shot cotton. The fun thing about infinity scarves is you can wear them so many ways. I like mine looped three times. 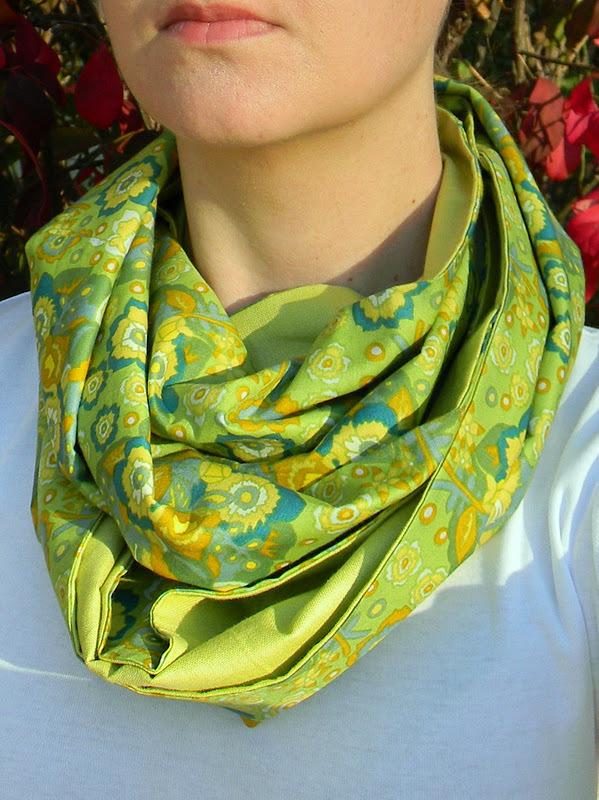 They look elegant and dramatic draped twice around the neck. I used Lauren's tutorial to make these; the only change I made was to shorten the length a few inches. The lipstick shot cotton on this one is so pretty! 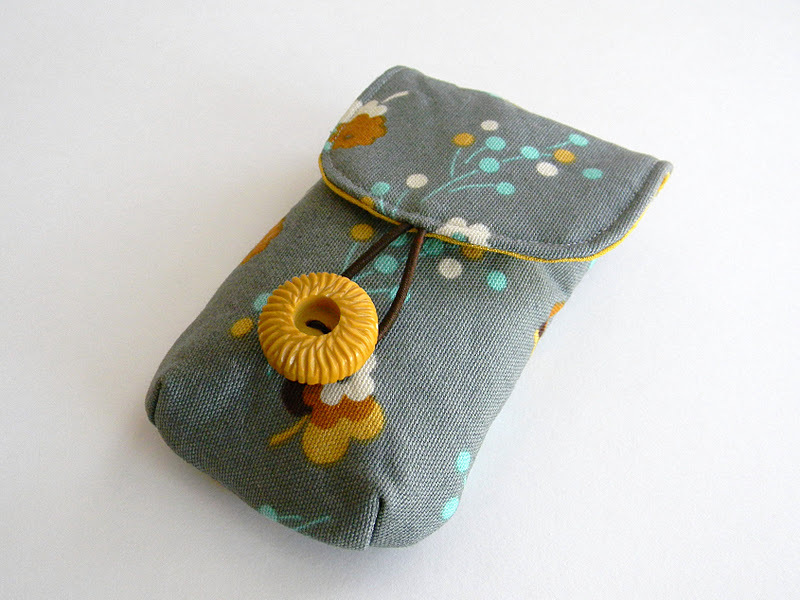 I made a few as gifts, and I put these three in my shop, just in time for Christmas shopping. My tiny, out of date cell phone finally has a case (just in time to be replaced? maybe? for Christmas?). 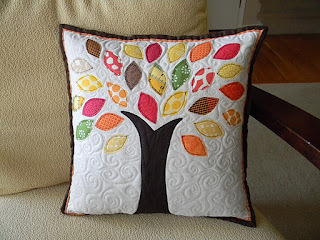 I made this using a great pattern by Keyka Lou. 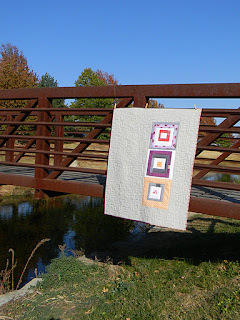 Really, all her patterns are easy to follow with lots of pictures for each step. I used scraps of County Fair home decor fabric leftover from this purse and a vintage button. 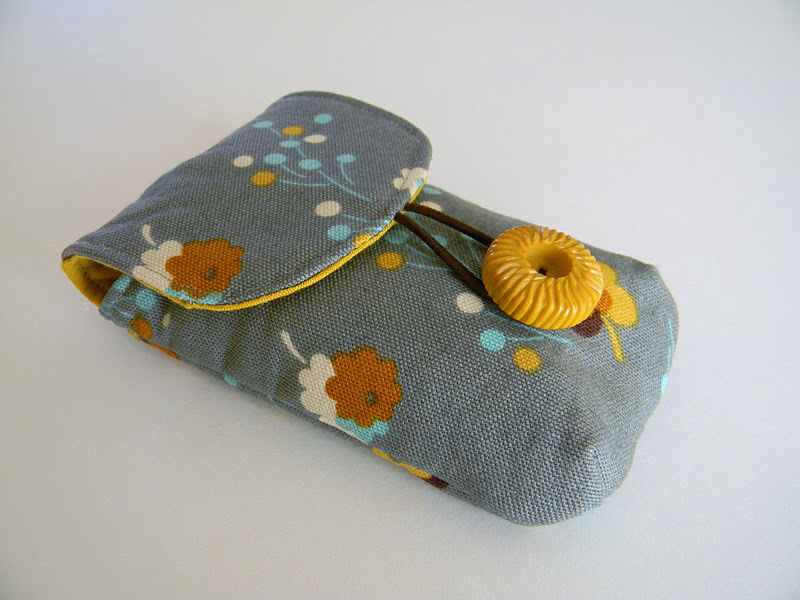 The only change I made to the pattern was to use fusible fleece rather than interfacing. 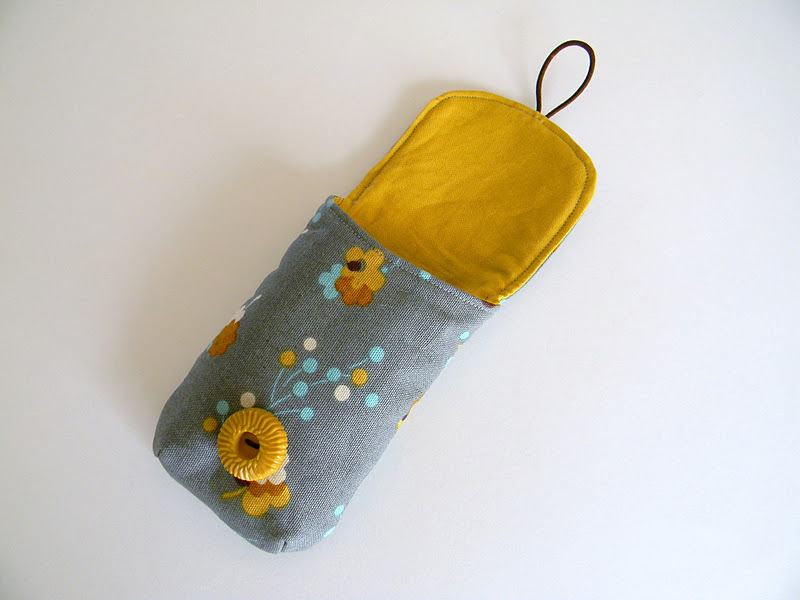 It gives it a nice weight and padding for the next time my poor phone gets dropped. 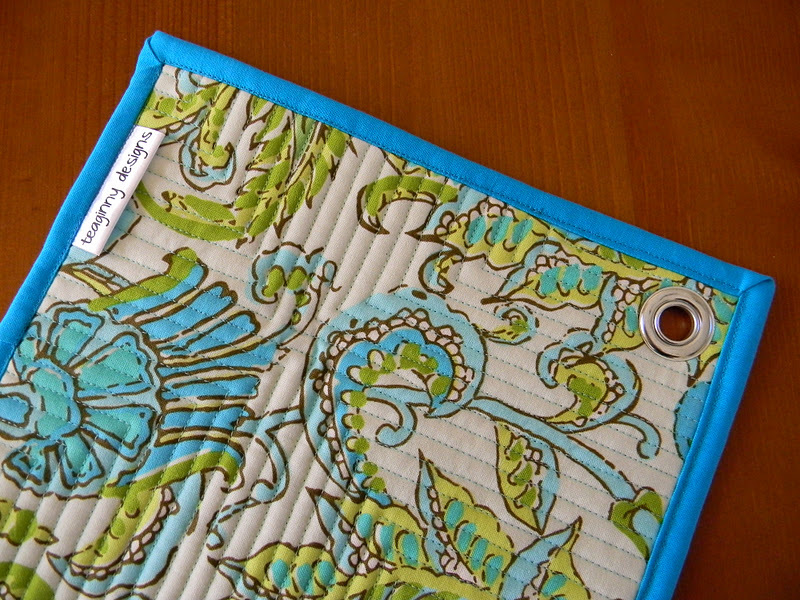 The pattern comes in two sizes; this is the small version. And since the patten is a pdf, I can easily print out the larger size, should I need it. Soon? 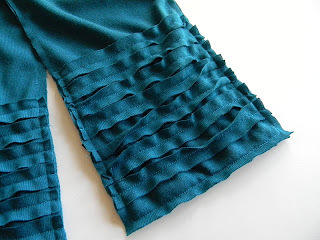 There are so many tutorials online for fun projects with jersey knit, so when I found a pretty teal knit on sale, I decided to try out a couple. 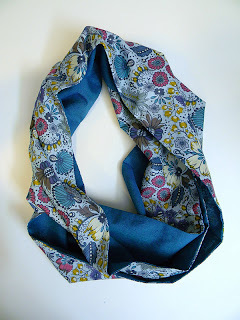 The first is a scarf I bookmarked ages ago by Make It and Love It. It is super simple and quick to make. This scarf is so soft and comfortable, let me tell you! 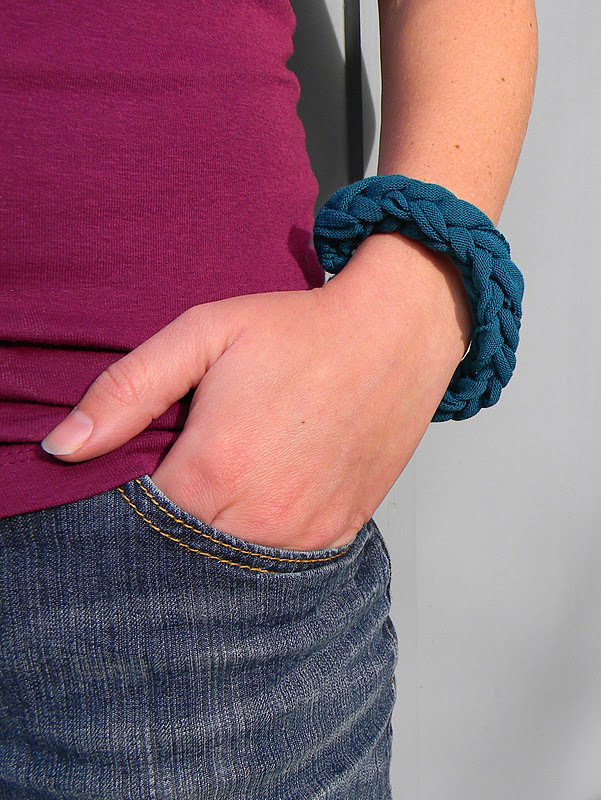 And check out this no-sew bracelet. Cute, right? 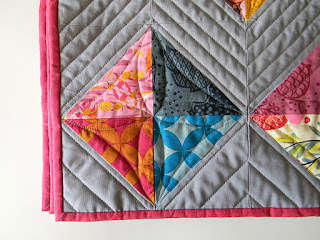 The video tutorial by Vanessa is good for visual learners. 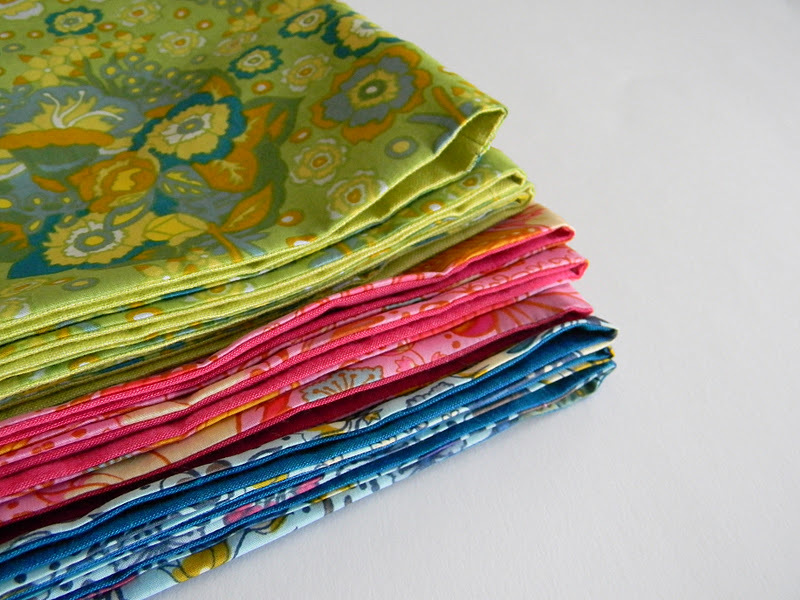 I bought 2 1/2 yards of knit fabric, which is enough to make 3 scarfs and several bracelets, making them very economical gifts. 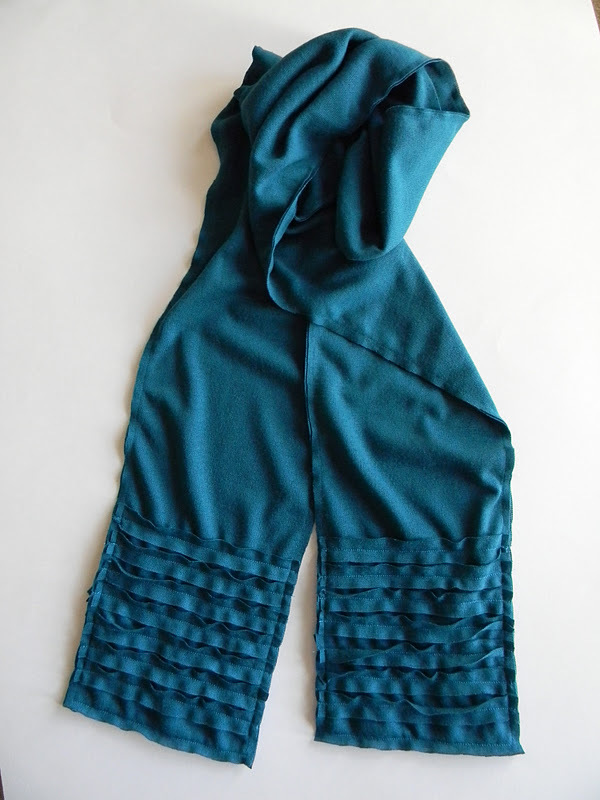 Of course, I'll need to get more jersey knit now, since I want to keep these two for myself. And I want to make more in some other pretty colors too. 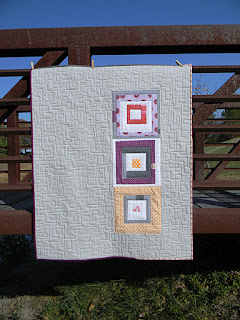 I finished up the baby quilt made from the trimmed HST from this quilt. 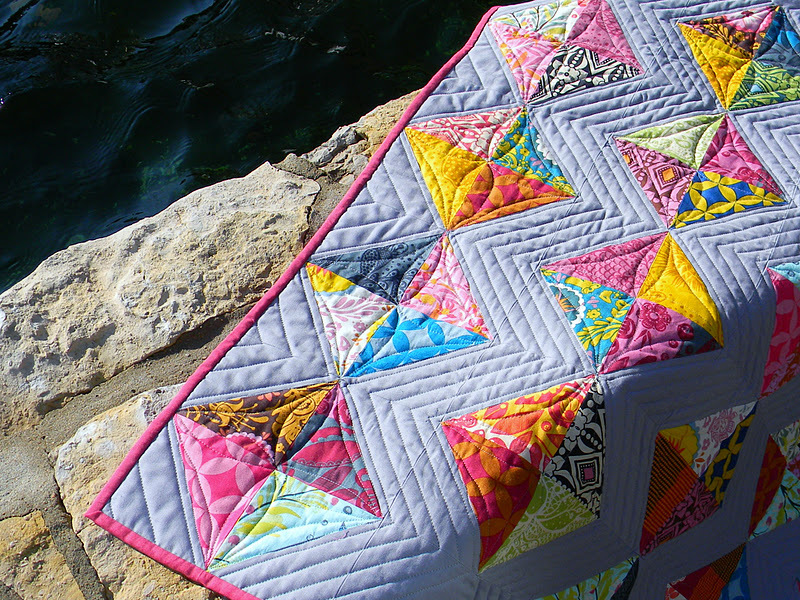 With the quilting, I emphasized the zigzag shape in the solid, and I tried a free motion design within the diamonds. I love the colors against the gray and that I get to showcase every fabric from my treasured Good Folks collection in one place. 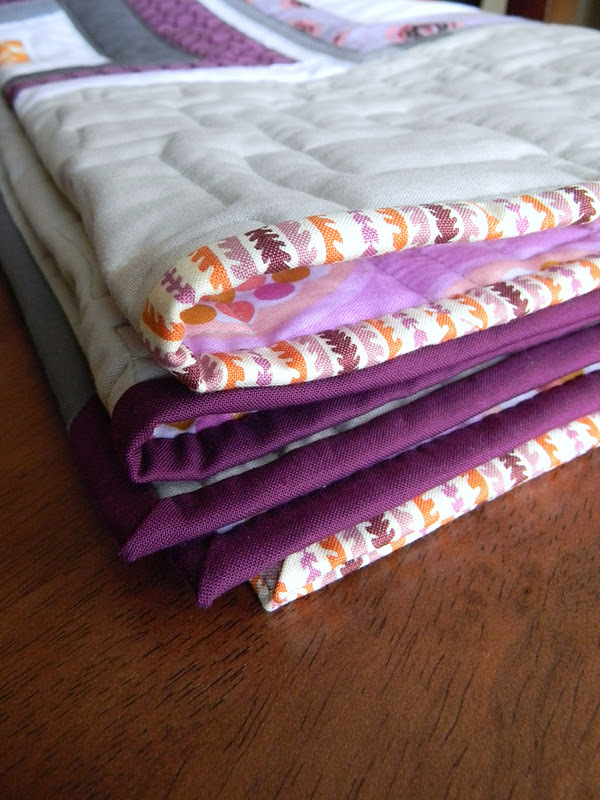 This was my first time binding a quilt with shot cotton, and it is perfect for binding - so lightweight and soft. The color is Lipstick. 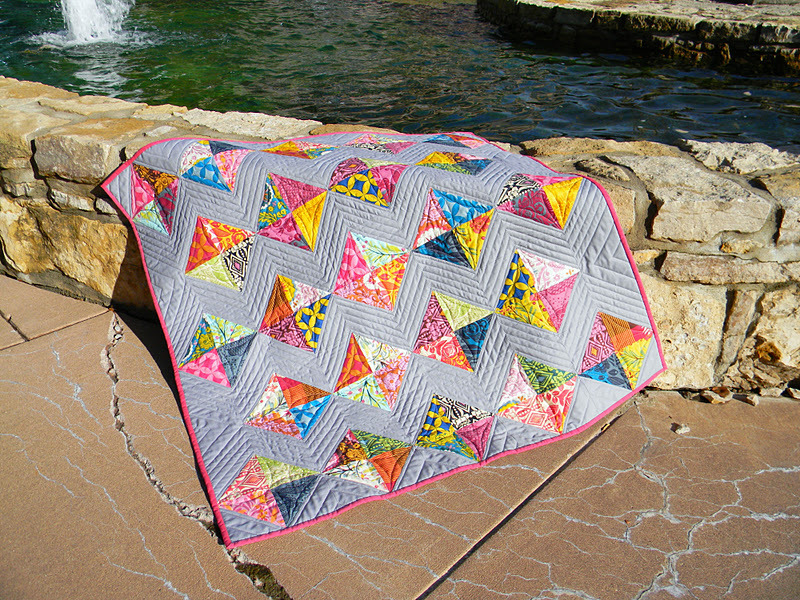 Another first for me with this quilt was a flannel backing. 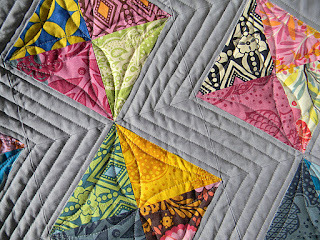 For some reason I thought flannel would be hard to quilt, but it was no different than quilting cotton. And it feels so great! Very cuddly for this baby quilt. 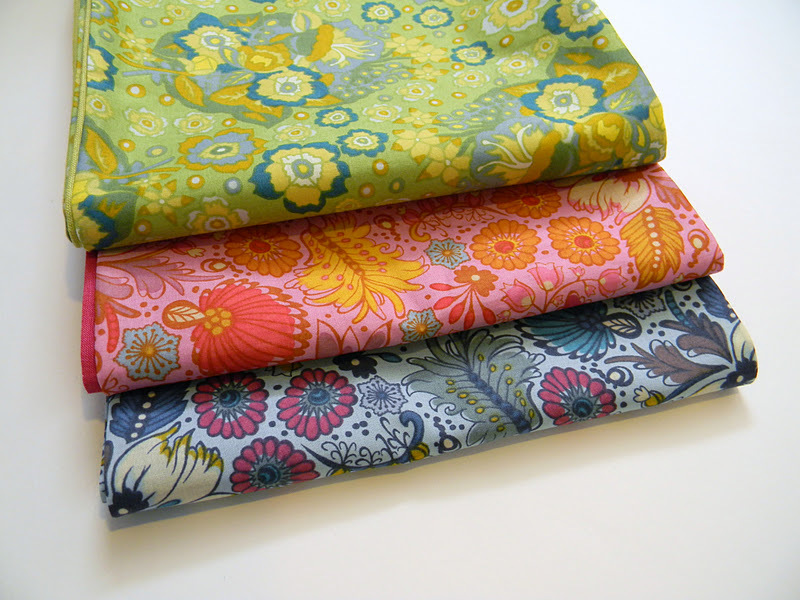 It is another Anna Maria Horner fabric, from her Folksy Flannel line. I really like how many of her fabrics, from various lines, coordinate well. 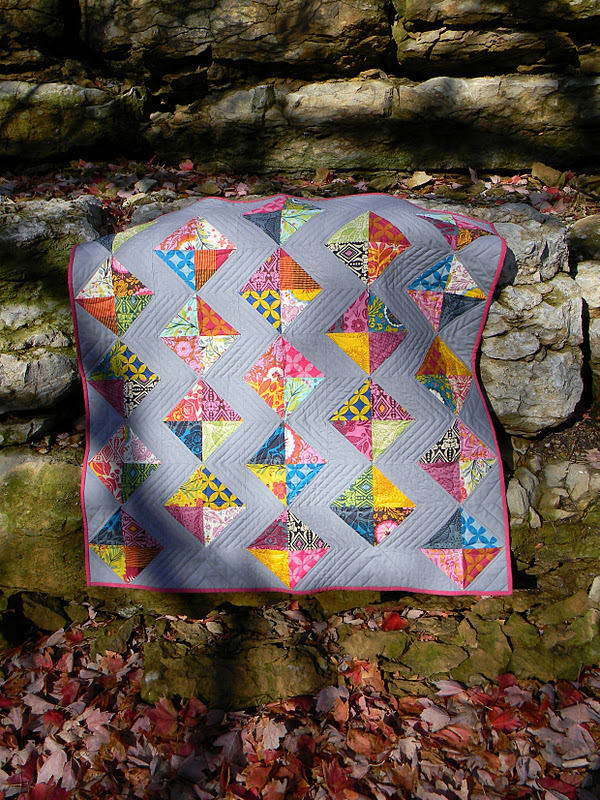 This baby quilt finished at 39 x 39. It seems I spoke too soon about being done with log cabins for a while. I had forgotten about my guild's log cabin potholder swap with the PMQG. I made a modern, random log cabin for my partner. She didn't list color preferences, so I made it with some of my favorites. This Amy Butler print was perfect for the back. 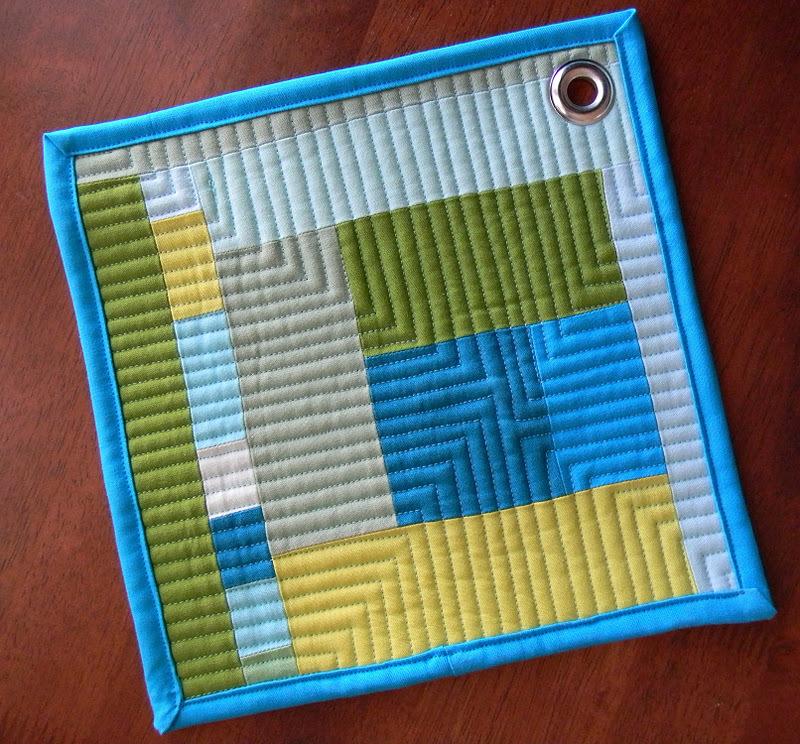 I'm looking forward to seeing all the other potholders made for the swap at our meeting next week. 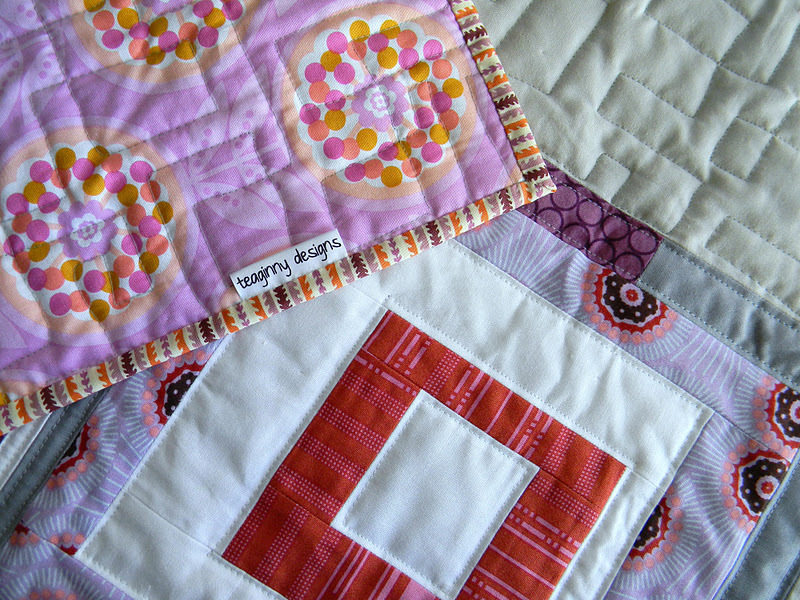 This is the final installment of my log cabin obsession, for now. 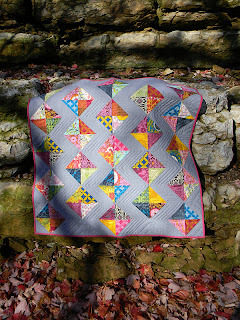 It has been fun to play with different numbers of blocks and various amounts of negative space in this quilt, as well as this one and this one. 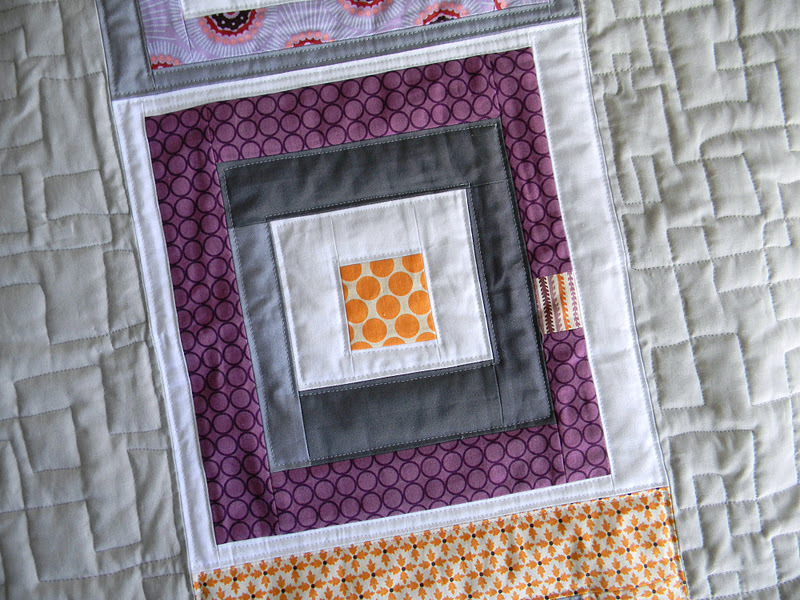 I like the minimalist feeling of the quilts. Using only a few blocks, set off by a wide solid space, focuses the eye on the fabrics and shapes in those few blocks. 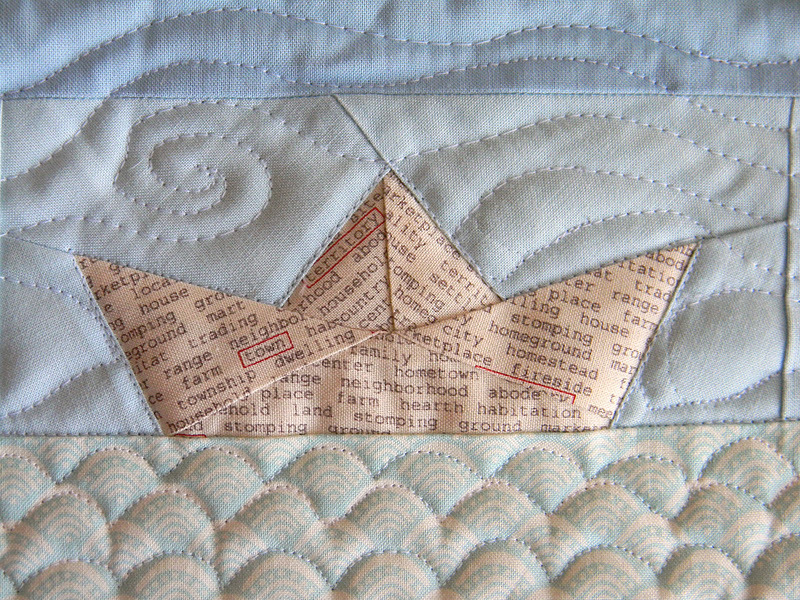 It has also allowed me to feature some squared off free motion quilting and a scrappy binding. I used binding strips left over from three other projects. There is the Hope Valley stripe, Kona berry, and Kona coal. The solid in the quilt itself is Kona ash. 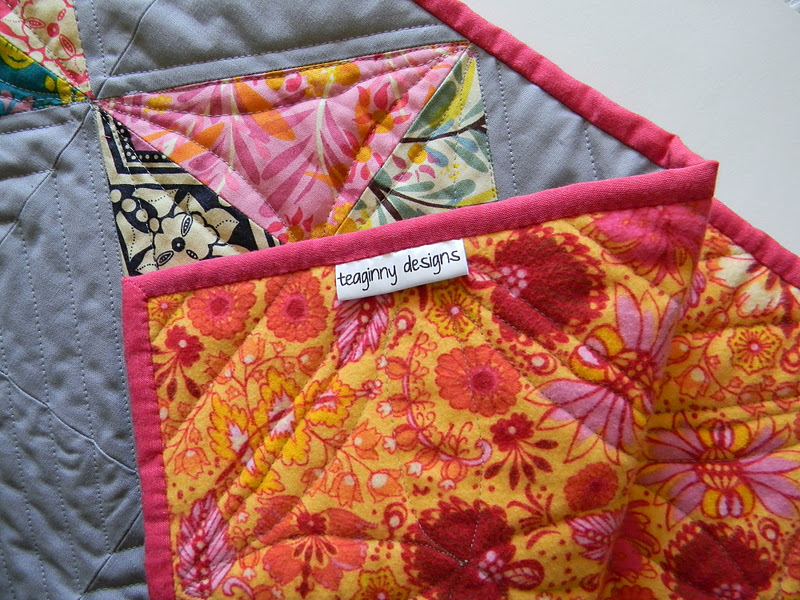 The backing is a great Erin McMorris print with happy pinks and purples. I think it adds a a whimsical, feminine touch to the quilt. This baby quilt finished at 37 x 45 and is available in my shop.